Damiano Michieletto's new production of Guillaume Tell was screened live in cinemas across the world on 5 July 2015. 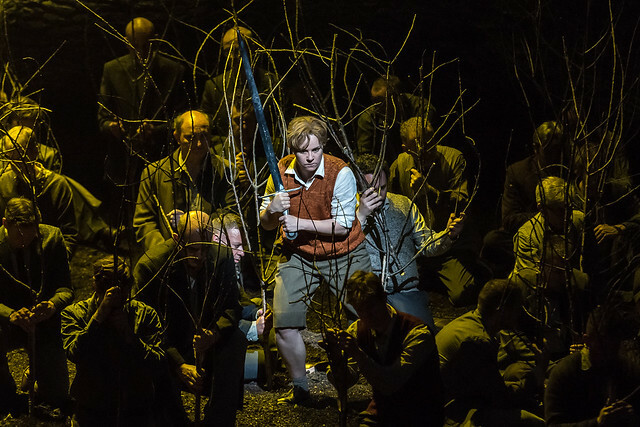 The production, which stars Gerald Finley, Malin Byström and John Osborn, conducted by Royal Opera Music Director Antonio Pappano, had its world premiere on 29 June 2015. Read audience reactions to the opening night and the live cinema screening. Guillaume Tell depicts the Swiss battle for liberation from repressive Austrian occupation. ‘Rossini had a very clear idea of the beginning and end of the piece, and the journey of the people of Switzerland overcoming this oppression,’ explains Antonio Pappano. ‘The finale is of another world. It is music of an idea – of liberty, freedom, brotherhood, closeness, humanity – and it’s gigantic in how it develops from just a stirring, to a vision of how the world can be’. Guillaume Tell features some of Rossini’s most inspired music, music that is harmonically daring and fiercely difficult for the singers. American tenor John Osborn performs the role of Arnold. Guillaume Tell is one of the first examples of French grand opera, a style characterized by large choruses. For more films, articles about and photos of the production, download our Guillaume Tell Digital Programme. Guillaume Tell was the final screening of the 2014/15 Live Cinema Season. Find an encore screening of Guillaume Tell and sign up to our cinema mailing list. The 2015/16 Live Cinema Season opens on 22 September with The Royal Ballet's Romeo and Juliet. The production is staged with generous philanthropic support from Hélène and Jean Peters and David Hancock. A marvellous sharing of the rehearsals for what is a marvellous musical and theatrical experience .Bravo to Antonio Pappano and orchestra ,to Damiano Michieletto and production team ,to all soloists and chorus and not forgetting the actors. The performance on Sunday 5th July was an unforgettable operatic treat ,the eventual DVD will provide a wonderful memory.